Some time ago Kelli and I participated in a quilt along featured by Quilting Galley. We came up with a block that we really liked with a pinwheel inside a star. I like it so much that I even designed a quilt and table runner that used the block. Only problem, we ran out of time and didn’t get either the table runner or the quilt made. Awhile ago Kelli got the table runner sewn and finally, I got it quilted and bound. For the quilting, I used a light brown thread and a VERY simple quilting design. The table runner is pretty big. It ends up being 17″ x 53″. I think it will look nice on the table in the house in town. There I will be able to keep all of the leaves in the table thus supporting a large runner. To make the table runner you need the printable directions to make the block which you can find here. To get the expanded directions to make the table runner, click on this link, Pinup Star Table Runner, for the free printable pattern. I will put a link to this blog post on the right side bar of the blog so you can easily find the link back to this pattern. Look for it under the name Pin Up Star Table Runner. 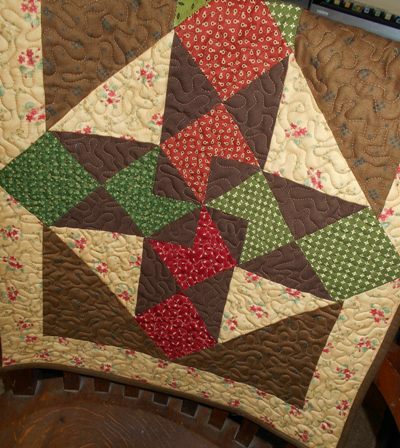 I would still like to make the quilt that I designed with the block….Isn’t that just like a quilter? We’re always looking ahead to our next project rather than basking in the accomplishment of having a project finished. This entry was posted in Tutorials, Uncategorized on February 21, 2014 by Jo. I really like your table runner. Thanks for the free pattern! Thank you for this great pattern, I have a large table in my dining room and need a runner of this size. Nice looking tablerunner! Love the block! Many thanks for sharing your wonderful table runner pattern, it’s great. 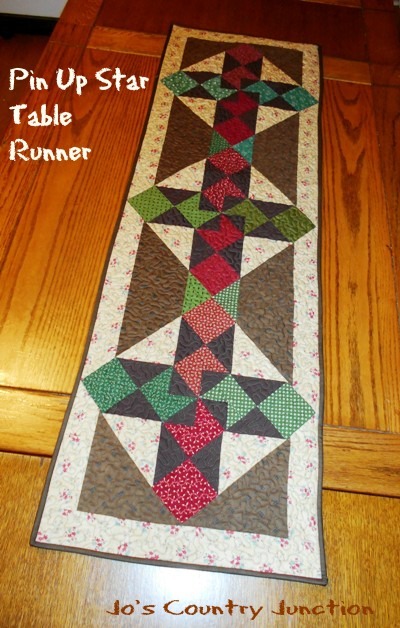 I have attempted to make this table runner (pin up star table runner) I am disappointed because when you look at the directions it shows two different pictures for the same runner. Also when you make the setting and corner triangles they are too big for insetting them against the square. I would love it if someone would help me to fit these triangles into the runner. This runner is so pretty – too bad the instructions were not correct. Hi Eleanor–I’m sorry that things haven’t worked out when you try to make this table runner. I’m confused as to which pictures you feel are different. The tutorial for making the block is in a different color way. It may be beneficial to just substitute the colors when making the blocks. The blocks should measure 12″ squared as a finished measurement. As far as the setting blocks go, I would recommend making sure that you have an accurate quarter inch seam allowance as once the blocks are set on the diagonal, the small difference in size can be increased because the blocks are on point. The setting triangles can be difficult to sew.